Matt Herron studied photography in Rochester as a private student of Minor White, and then worked as a writer and photographer for the American Friends Service Committee in Philadelphia. 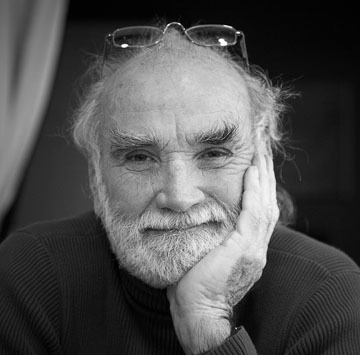 A conscientious objector during the Korean War, Herron was organizing peace demonstrations and beginning to shoot assignments for Life and Look at the time the first sit-ins were occurring in Tennessee and North Carolina. He was arrested for attempting to integrate an amusement park in Maryland in the summer of 1963 and shortly afterward he and his wife, Jeannine, moved to Jackson, Mississippi with their two small children. They were the only family to move south and join the civil rights movement. For the next two years Herron pursued three styles of photography: classical photojournalism for the major picture and newsmagazines, documentary photography as practiced by his mentor, Dorothea Lange, and photography as propaganda in the service of the Student Non-Violent Coordinating Committee (SNCC) and other civil rights organizations. Often he was able to use news assignments as cover for a more documentary style of work. In the summer of 1964, Herron organized a team of five photographers, The Southern Documentary Project, in an attempt to record the rapid social change taking place in Mississippi and other parts of the South as civil rights organizations brought northern college students to work in voter registration and education. George Ballis and Danny Lyon were among the Southern Documentary photographers and Dorothea Lange served as informal adviser to the project. In the fall of 1964 the Herrons moved to New Orleans rather than enroll their children in Mississippi schools, but they continued to be active in the civil rights movement. In the summer of 1965 they moved back to Mississippi where Jeannine was co-founder and program director of the Child Development Group of Mississippi, the first and largest Headstart program in the country. 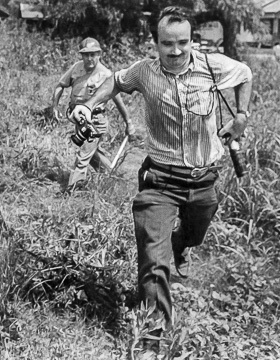 That year Matt won the World Press Photo Contest for his picture of a Mississippi highway patrolman attacking a five-year-old child. In New Orleans, Herron began cooperating with District Attorney Jim Garrison, who was investigating the assassination of President John F. Kennedy. Herron had flown to Dallas on the day of the assassination, and looking at Dallas police reports with Mississippi eyes, had been among the early skeptics of the Oswald-as-lone-assassin theory. When Garrison lost his case against Clay Shaw, the Herrons left the US for a year-and-a-half sailing voyage to West Africa that carried them down the coast from Mauritania to Ghana. Their book, The Voyage of Aquarius, recounts this journey. A recent book, Our Big Blue Schoolhouse, chronicles that passage in the words of their son, Matthew, who was 13 at the time. In the 70's, with all the major picture magazines dead and gone, Herron retrained himself as a writer. For the next ten years he wrote articles for Smithsonian and other publications. He also became active with animal rights organizations, serving as bridge officer, navigator and photographer for the first two Greenpeace anti-whaling voyages. He was first mate and photographer on the Sea Shepherd's voyage to the ice floes of the St. Lawrence to attempt to disrupt the harp seal hunt. He was arrested on the ice and spent six days in a Canadian jail. During the 80's Herron became active with the American Society of Media Photographers (ASMP), the leading trade association for photographers who shoot for publication. He served as President from 1993 to 1995, and then as International Director and as Chairman of Media Photographers Copyright Agency, ASMP's online marketing system for electronic images. He has lectured extensively in the US and abroad on such topics as copyright, electronic image marketing systems, and business practices in photography. In 2012 he curated a 158-print photography exhibition, This Light of Ours: Activist Photographers of the Civil Rights Movement, featuring nine photographers who joined the civil rights movement and shot it from the inside. This Light opened in Salt Lake City and is now touring the US. The University Press of Mississippi has published a companion volume to the show. In 2014 Herron published Mississippi Eyes, the story of the Southern Documentary Project. Reviews of this book are available here. The Smithsonian Institution Traveling Exhibition Service has recently agreed to host a US tour of his 50 print exhibition on the Selma March and Voting Rights. His photographs are in the permanent collections of the National Museum of African American History and Culture, the Birmingham Civil Rights Institute, the Memphis National Civil Rights Museum, the Smithsonian Institution, the High Museum of Art, the Schomburg Center for Research in Black Culture and the George Eastman House. He is the subject of several profiles, including Witness in Our Time: Working Lives of Documentary Photographers, and a cover story in the Princeton Alumni Weekly, June 2014. Matt Herron is the Director of Take Stock, a stock photography agency representing photographers active in the field of civil rights and the struggle of farm workers. In his spare time he plays double bass in a community orchestra, and flies his glider in contests and cross-country tours of the deserts and mountains of California and Nevada.